Every homesteader needs a little travel adventure, too, right? It takes a bit of coordinating, but we try to make it happen a few times each summer, and it works out with the help of some extremely generous friends and neighbors! 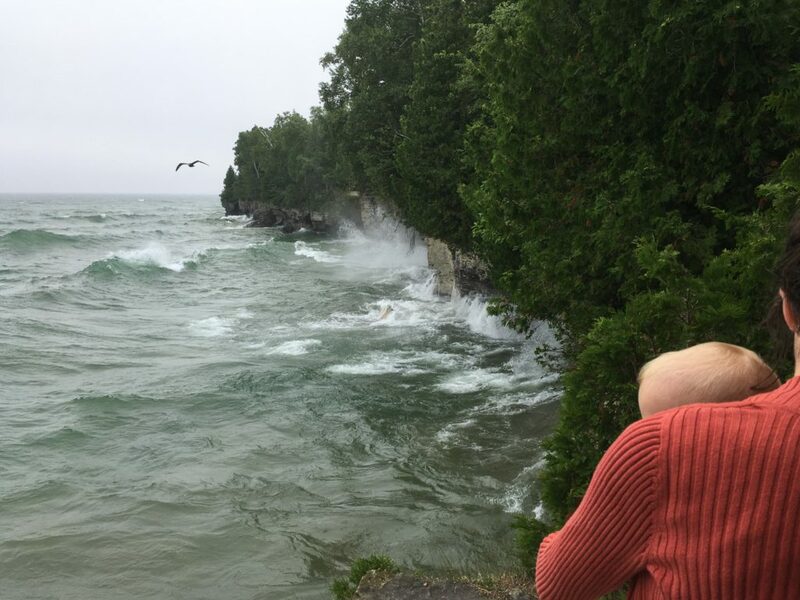 There is a lot to do on the little peninsula that juts out into Lake Michigan – Door County, Wisconsin. Our short couple of days didn’t afford us the time we needed to really explore those amazing waters, views, rocks formations, beaches and quaint farm country. 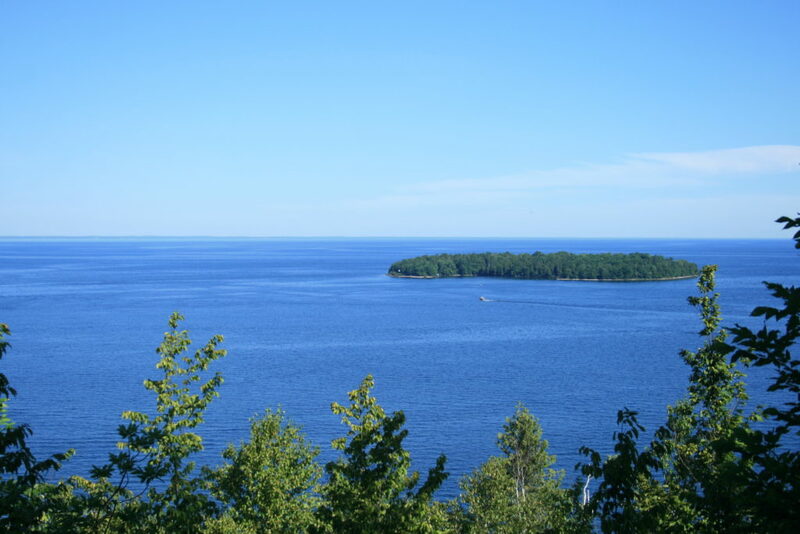 The above picture is a view of Lake Michigan from atop a bluff so tall you can see over the treetops. It was a perfect spot for watching a sail boat race. 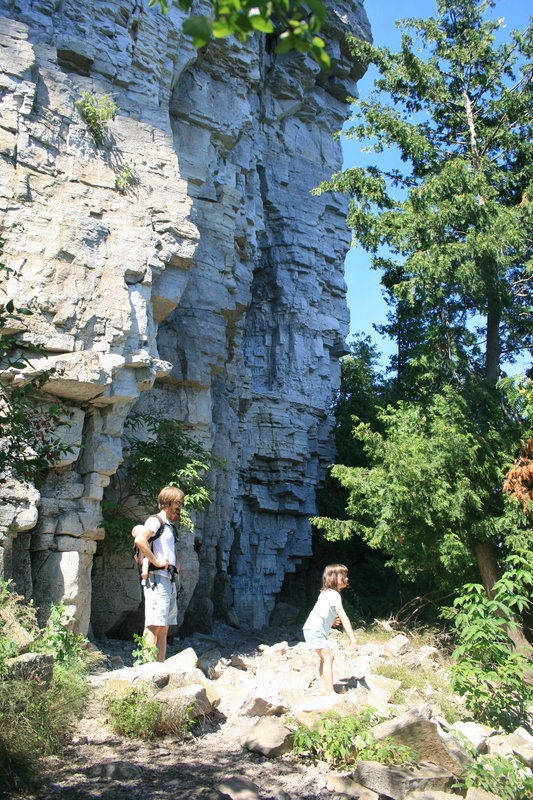 These limestone rock formations at Peninsula State Park are from the same escarpment that gave us Niagara Falls. While the water doesn’t gush with the same force, we discovered streams trickling down the bluffs along our hike. According to R, if you wind up hard enough, you might get one of those smooth white rocks that adorn the shores to fly over the trees and land in the lake. Maybe. That same limestone takes a beating down near the waters, hollowing out caves that can be explored by kayak. The waters were too rough to put a kayak in, so we found a spot to watch the massive spray as the waves pounded the rock. 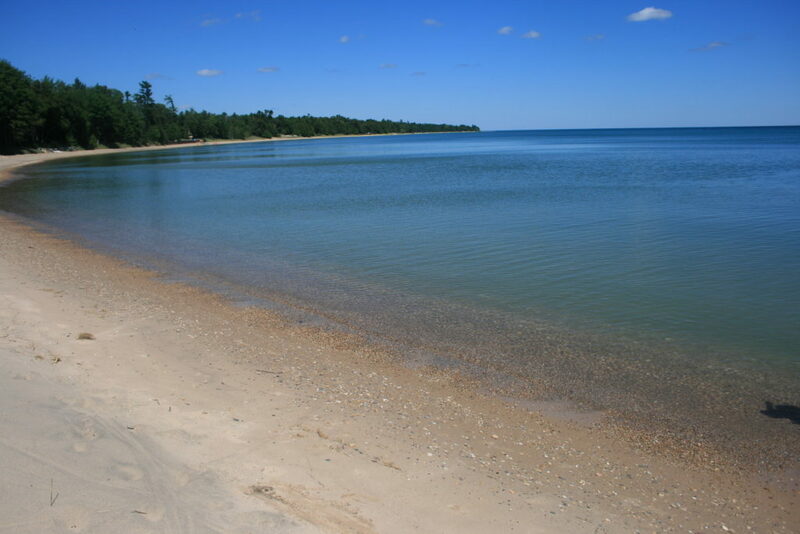 The coast is littered with small pristine beaches along both sides. While this photo can’t quite capture it, the turquoise waters and fine sand were akin to more popular beaches found in Florida and Costa Rica. There wasn’t the same mass of people, though, and the water sure was colder! 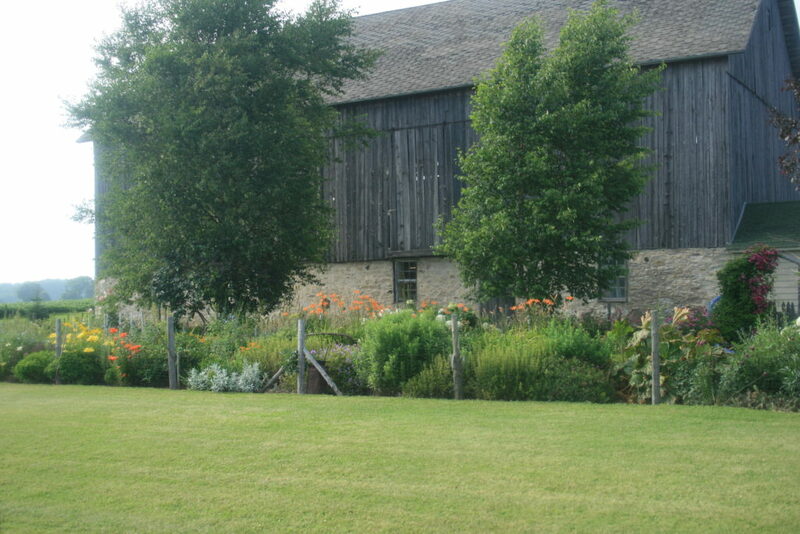 During our travel, we took some country roads in place of the highway and were rewarded with quaint views of well maintained homesteads, barns of old stone foundation and tons of gorgeous flowers! Of course we made our trip complete with a stop at a pick-your-own farm to participate in what Door County is perhaps most famous for – cherries! I highly recommend the friendly folk at Barnard Farms on the outskirts of Sturgeon Bay. They use organic practices and had the most productive trees! 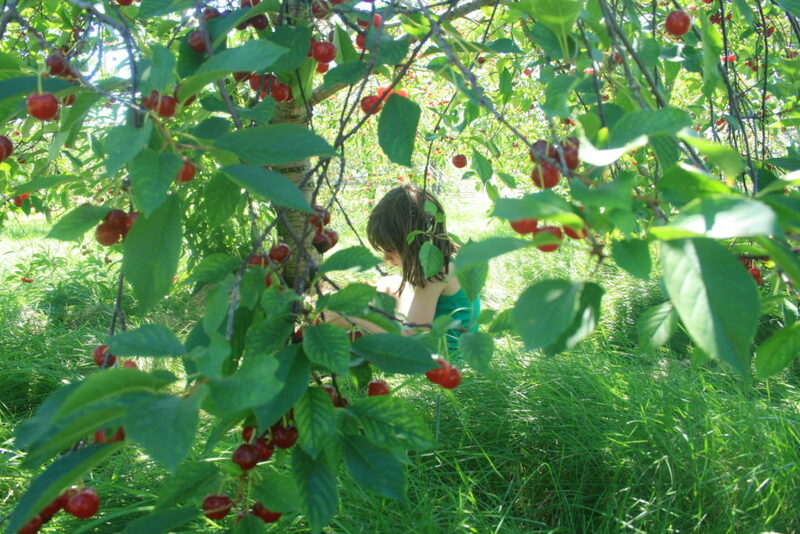 R found a perfect shady spot under a tree where she could sit, but still fill her belly with cherries. 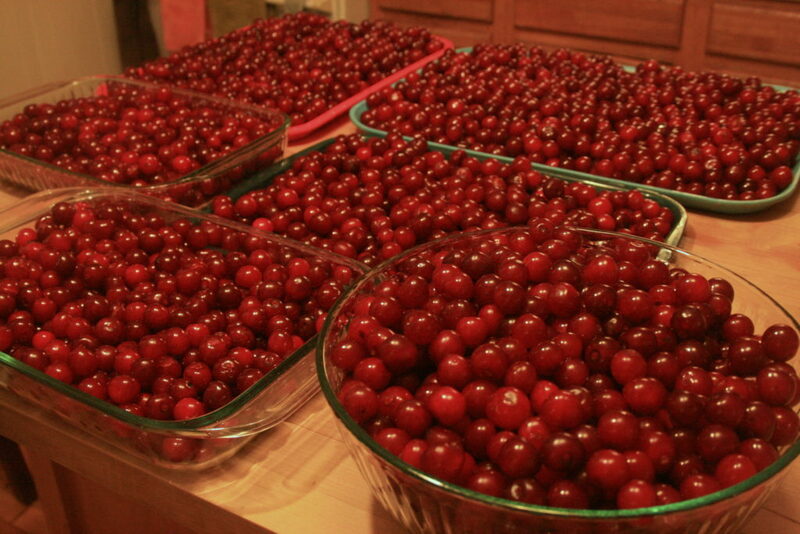 With huge, juicy clusters of cherries weighing heavy on every tree, we quickly filled four large pails of fruit, bringing home around 40 lbs of cherries! 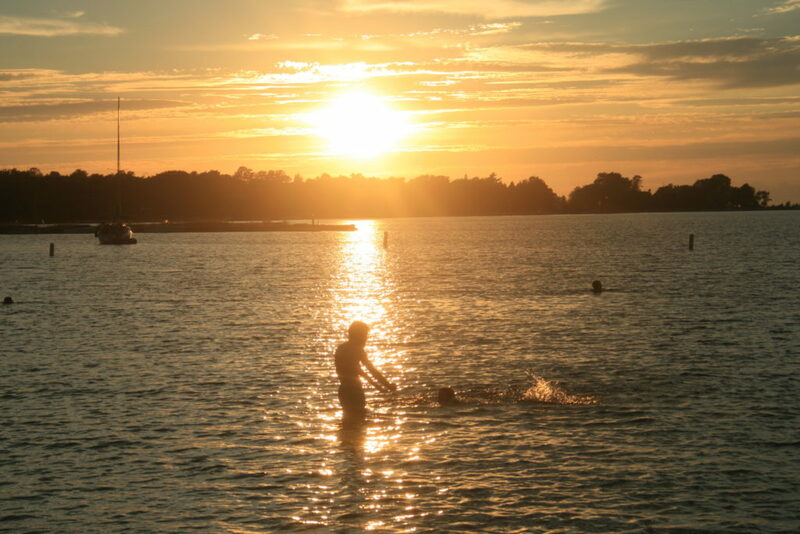 We capped our day with a dip in the sunset-lit waters of Lake Michigan. What travels have pulled you away from home and really wowed you?